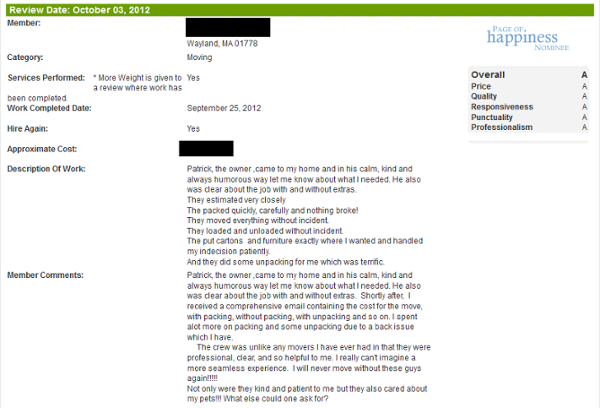 Brookline Moving Company reviews are abundant. We have consistently received positive feedback in the vast majority of movers reviews our customers have posted on line, mailed to us, telephoned us or communicated to us in person. You can be very comfortable in choosing to do business with Brookline Moving Company. But, of course, don't just take our word for it, please read our moving company reviews. We have compiled many of our movers reviews for you here from across the web. Please feel free to cross reference these Brookline Moving Company reviews on the multiple moving companies reviews sites at your disposal. We welcome the opportunity to provide you with "Nothing But Service". We look forward to working with you and will do everything we can to earn our next positive moving company review from you. Please see below for our moving company reviews from various sites such as BBB, Yelp, and Service Magic. I would highly recommend Brookline Moving Co. to anyone. The entire process, from estimating the job, the actual moving process and the follow up were outstanding. The men were professional, performed their job quickly and efficiently. Most importantly...not one item was damaged! Seamless move to DC. The whole team was professional and the cost was under estimate. 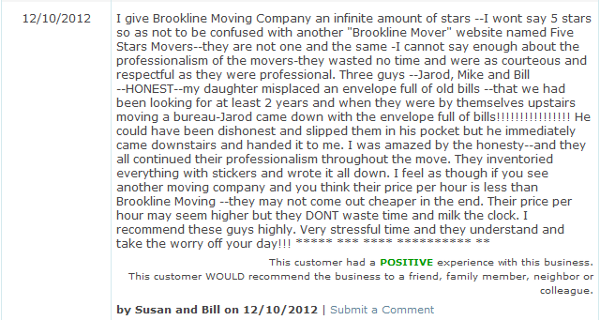 We were impressed with Brookline moving company. Brookline Movers are considerate, reasonable, and good at their job. Have used them for short and long distance moves. I give Brookline Moving Company an infinite amount of stars --I wont say 5 stars so as not to be confused with another "Brookline Mover" website named Five Stars Movers--they are not one and the same -I cannot say enough about the professionalism of the movers-they wasted no time and were as courteous and respectful as they were professional. Three guys --Jarod, Mike and Bill --HONEST--my daughter misplaced an envelope full of old bills --that we had been looking for at least 2 years and when they were by themselves upstairs moving a bureau-Jarod came down with the envelope full of bills!!!!!!!!!!!!!!!! He could have been dishonest and slipped them in his pocket but he immediately came downstairs and handed it to me. I was amazed by the honesty--and they all continued their professionalism throughout the move. They inventoried everything with stickers and wrote it all down. I feel as though if you see another moving company and you think their price per hour is less than Brookline Moving --they may not come out cheaper in the end. Their price per hour may seem higher but they DONT waste time and milk the clock. I recommend these guys highly. Very stressful time and they understand and take the worry off your day!!! 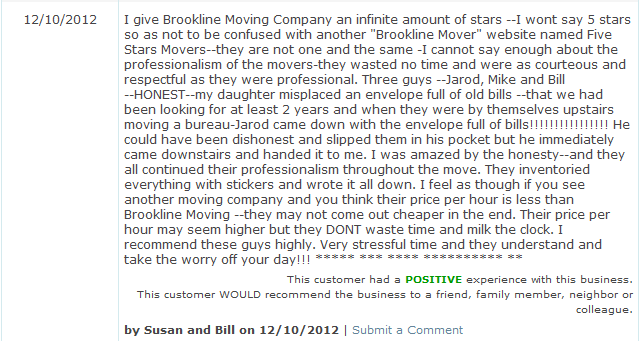 Brookline moving company is extremely professional and courteous. We had a very positive experience working with them...and they answer their phones every time! These guys were great! They were very prompt in responding to my request for a quote, stayed right on budget (even went a little under) and were all around wonderful to work with. They moved me in seamlessly and the team (Patrick, Jason & Dave) were the BEST!!!! This is my third move in 3 years and Brookline Moving Company, by far, was the best way to go for cost, efficiency, friendliness and service. On 5/27/12 I retained Brookline Moving to move my son from his apartment to a storage unit in Stoughton. I must say, that your three moving associates were outstanding. They showed up on time, were thorough, accommodating and very professional. The move was executed very timely and less stressful than we anticipated. I would recommend your moving company to anyone who has the need to move and thank you once again for your accommodating and professional service. Please thank your team once again. They stored my belongings free of charge while I was between homes for 3 weeks. I had quite a bit of clutter/garbage and they helped me organize it all, dispose of the trash, and pack the miscellaneous and odds and ends that can pile up and be a real pain. They dropped off boxes a few weeks before the move (free delivery) and did the last minute packing for me that I didn't get around to. The move went smoothly and there was no damage whatsoever. Excellent experience. The job was small--moving less than 20 items from Boston to Portland, Maine. 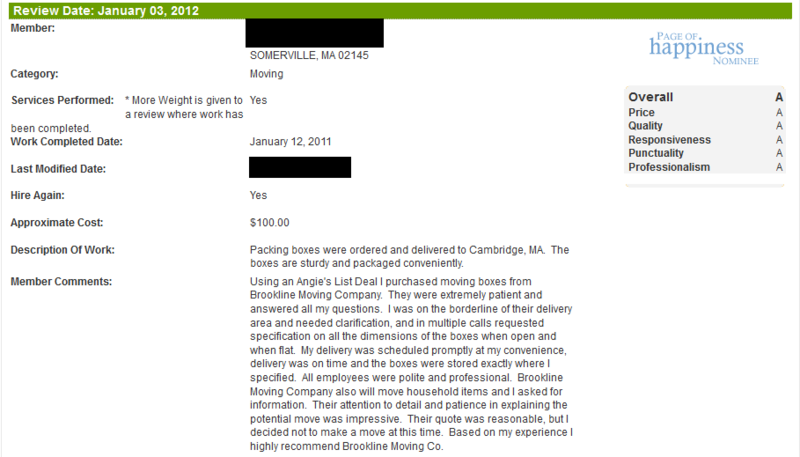 I called several moving companies, and Brookline Moving was the first that was interested. On the day of the move, March 21, the movers called just before arriving, so my husband was ready for them. The items were loaded, fragile ones safely padded, and the truck was on its way in less than an hour. As they approached my home in Portland, they gave me a call, so I could get things in order. Thanks Javier and Michael for taking care of my stuff and getting it to Maine! These guys were absolutely fantastic. Their bid came in under several others, so we were worried they might charge more once they arrived, but they actually charged less than their estimate! They arrived on time, were very personable, and worked efficiently. They had already scoped out the start and stop destinations, so had parking and elevators under control. They handled boxes and furniture with care, and nothing was lost or damaged. I would highly recommend them. Patrick, the owner ,came to my home and in his calm, kind and always humorous way let me know about what I needed. He also was clear about the job with and without extras. They estimated very closely The packed quickly, carefully and nothing broke! They moved everything without incident. They loaded and unloaded without incident. The put cartons and furniture exactly where I wanted and handled my indecision patiently. And they did some unpacking for me which was terrific. Patrick, the owner ,came to my home and in his calm, kind and always humorous way let me know about what I needed. He also was clear about the job with and without extras. Shortly after, I received a comprehensive email containing the cost for the move, with packing, without packing, with unpacking and so on. I spent alot more on packing and some unpacking due to a back issue which I have. The crew was unlike any movers I have ever had in that they were professional, clear, and so helpful to me. I really can't imagine a more seamless experience. I will never move without these guys again!!!!! Not only were they kind and patient to me but they also cared about my pets!!! What else could one ask for? Good timing since we were getting ready to move. Ended up paying an extra $25 to have the boxes delivered since we were outside their "free delivery" zone, but it was worth it. They allowed me to customize the order to stay within the sale price and get only the materials we needed. Easy to work with and helpful folk all around. I've since heard other good things about this company, and would do business with them again. Using an Angie's List Deal I purchased moving boxes from Brookline Moving Company. They were extremely patient and answered all my questions. I was on the borderline of their delivery area and needed clarification, and in multiple calls requested specification on all the dimensions of the boxes when open and when flat. My delivery was scheduled promptly at my convenience, delivery was on time and the boxes were stored exactly where I specified. All employees were polite and professional. Brookline Moving Company also will move household items and I asked for information. Their attention to detail and patience in explaining the potential move was impressive. Their quote was reasonable, but I decided not to make a move at this time. Based on my experience I highly recommend Brookline Moving Co.
Brookline Moving Co. just moved my furniture today. This by far has been the most stress-free move ever. I have moved coast to coast, across the state and to different cities - hiring at least 7-8 various moving companies. Brookline Moving Co. is the most courteous and professional outfit I have ever used. They showed up early, the ALL worked hard at the SAME time, did not leave a mark on any on my walls, no dirty hands on any bedding or furniture - super polite. They were all calm and friendly even though I had two stops in the city to pick up furniture. Unbelievably -the price quoted was the price I paid. 5 Stars. Big thanks to Mike P, Mike, David A and Havier! 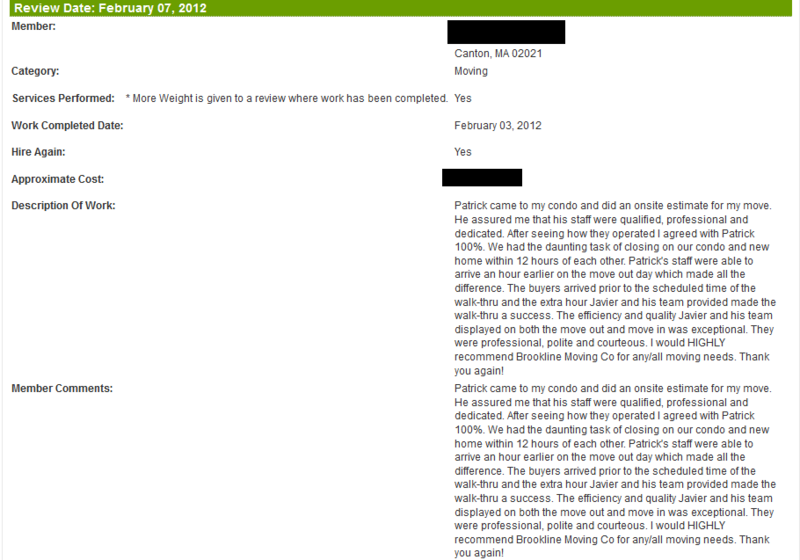 We worked with Brookline Moving Company In November 2012. They were extremely professional. We had a lot of complicating factors along the way and they helped us through everything. They also always answer the phone which is rare! Awesome,friendly and on time,Brookline Moving Company is the best! Consumer advocates are constantly warning us to be aware of disreputable moving companies. I think my experience with Brookline Moving, as minor as it was, is probably a good indicator of their ethics. They moved my tenant out of my second floor apartment and there was minor damage to a wall. I got an estimate and they immediately paid it; this was after they had been paid for their work, so they had no incentive, other than to do the right thing. By the way, I just realized my former tenant used them when she moved in too, so I assume she was happy with them too. I cannot speak highly enough of Brookline Moving Company. Patrick and Neil were incredibly responsive and helpful in our communications before the move, and Dan, Bill, and Jason were fantastic on our moving day. They treated all of our furniture and boxes with utmost care, and were upbeat and fun to work with throughout the day. This was our first experience with movers, and I have to admit that I was a little nervous given all of the horror stories I'd heard. I needn't have worried - Brookline Moving Company took care of us every step of the way! This is the best moving company you could hire! Javier and his team were professional, and also kept a great sense of humor for the entire 8 hours of moving heavy furniture. They are definitely worth hiring, as they know how to maneuver furniture through seemingly impossible spaces. My family has moved over 8 times in the past 23 years (this is our first time using Brookline Movers) and they are by far the best ever. I will definitely be using them again in the future. I was concerned they might be late since I had the move scheduled for early on a Sunday morning, but in fact, they arrived early! I was amazed how easy they made it look. Everything went perfectly at bolth ends and I was 100% satisfied. These guys were great! Fast, fast, fast. And very nice. This company is SUPERB! They are True Professionals. They were extremely Solution Minded. All the little, (and a few large), problems that arose during the scheduling of, and fulfillment of, my relocation were seamlessly resolved. Brookline Movers offered unbelievable flexibility and even some very innovative solutions for all the demands my relocation forced me to make on their company. The services were Great. The men were conscientious, courteous and most accommodating. When first scheduling my move, I thought their prices were competitive. Looking back now, factoring in the quality of services received, I know their pricing is truly cost effective and quite reasonable. I will recommend Brookline Movers to everyone! 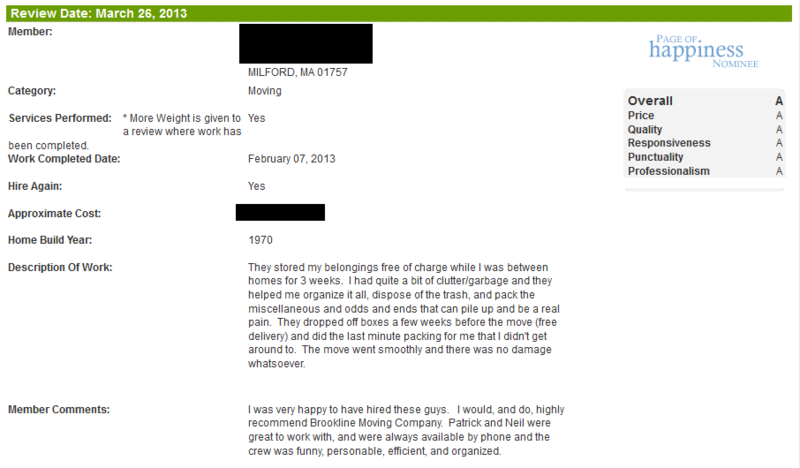 I would highly recommend Brookline Moving Co. Patrick was accessible and incredibly helpful. We had a small move in our house but the company was willing to consider it and charge fairly. Mr Lundgren worked with my niece to make it happen for us while we were away. The price was very reasonable (the best). Their staff did their job well and efficiently. Brookline Moving Company has been in business since 1920. During those last 93 plus years, our staff of dedicated men and women has worked diligently to build and maintain a reputation of professionalism an excellence. We believe the single most important asset our company possesses is the public trust that we have worked hard to earn since our inception in 1920. Our company has been recognized as an industry leader for providing professional services and for delivering the highest level of customer service. We are a BBB accredited business and have continuously maintained an A+ rating with the Better Business Bureau. We have won multiple Super Service Awards from Angie's List and have consistently maintained their highest of rankings. We have earned and maintained a Five Star Rating on Home Advisor dating back to the days when Home Advisor was formerly known as Service Magic. Brookline Moving Company has been awarded the CMUS Talk Of The Town Award multiple times for providing Outstanding Customer Service and have consistently maintained a five star rating with CMUS. We have also been honored with the UNEX Corporation Customer Service Award for an unprecedented, record five times. We are multiple winners of The Garrity Foundation Leaders Circle Award. We have earned the PNC Survey Group - Proactive Response Award. Brookline Moving Company has also been honored with the Town Of Brookline Community Service Award. We are proud members of The Massachusetts Movers Association and The American Moving and Storage Association. Brookline Moving Company is a service based business that believes in the time honored addage that "THE CUSTOMER IS ALWAYS RIGHT". We endeavor daily to abide by our company motto, "NOTHING BUT SERVICE", and promise to deliver such to our customers. The values and beliefs of our company and our employees is the cornerstone of our business. Our reputation for honesty and integrity is vital to our existence as successful professionals in the industry. Moving companies reviews are abundant on the internet and can serve the consumer well when trying to choose a moving company for their relocation needs. Moving company reviews should be looked at closely to determine what type of company you are considering hiring. Moving company reviews must also be looked at closely to determine their validity. Not everything on the internet is true! Some movers reviews are falsified; Either to artificially benefit a company or to detrimentally affect a company. To ascertain the the full benefit of on line moving companies reviews, check multiple movers reviews sites. Give the most weight to the moving company reviews that are on sites that verify the movers reviews. 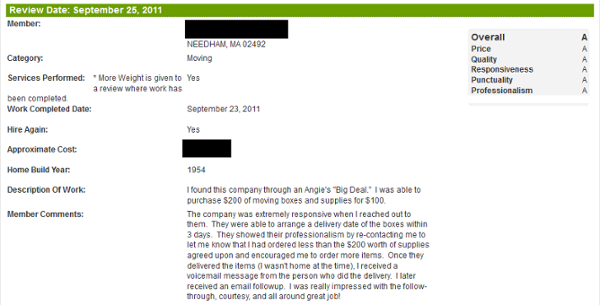 Angies List movers reviews are paid members whose identities are verified, these moving company reviews are probably trustworty. Home Advisor, (formerly Service Magic), movers reviews are paid members whose identities are verified, these moving company reviews are probably trustworty.The Better Business movers reviews are at least email address verified and these moving company reviews are probably trustworthy. Sites like Yelp, Google, Yahoo are also beneficial when researching moving companies reviews. However, these sights may not need much or any real verification to post movers reviews. Even still, these moving company reviews, considered collectively with the plethora of moving companies reviews sites, should help you to determine the overall validity of the movers reviews. Please find a compilation of Brookline Moving Compay reviews above; these are actual movers reviews, from actual customers, that we have collected from a cross section of multiple moving companies reviews sites across the internet. We believe they are a testament to our commitment to being truly professional movers and to providing you with "NOTHING BUT SERVICE"
Brookline Moving Company would like to take this opportunity to thank all of our customers for their business and continued patronage. We would also like to extend a special thanks and gratitude to all of our customers who took the time to publically provide Brookline Moving Company Reviews on line. These company and specific movers reviews help us in our never ending pursuit of continuous improvement. These Moving company reviews also provide a valuable resource to those consumers who are in need of professional moving services. Contact us today, with complete confidence in our ability, for all your relocation needs! As stated at the top of this page, Brookline Moving Company welcomes the opportunity to provide you with "Nothing But Service". We look forward to working with you and will do everything we can to earn our next positive moving company review from you. © 2014 Brookline Moving Company. All Rights Reserved.